But there are lesser known riders ready to spring surprises, such as Daniel MÖRBE (Husqvarna), Cole COOKLAND (Sherco), Rafal BRACIK (PL – KTM), Eddie FINDLING (D – Gas Gas) and Richard TUCKER (GB – Sherco). Over in the Open 4-Stroke class we find 12 entrants, and one big favourite for the title; Portugal’s Luis OLIVIERA (KTM). But we’ll also need to keep an eye on JET Zanardo’s Enzo PELLEGRINI (CHL – KTM), Austria’s Bernhard SCHOEPF (KTM), and Britain’s Thomas ELLWOOD (Kawasaki) as well as Belgian rider Mathias VAN HOOF (Beta). We also see the return of Bas KLEIN HANEVELD (NL – Husqvarna) and his Dutch compatriot Thijs BULTEN (Husqvarna). Finally, the category which sees the most riders, with 35 entered, is the Open Senior! Of course we’ll have a lot of German riders in this World Cup, but the most notable international entries are Andrea BELOTTI (I – KTM), Hans Peter MUSIL (AUT – KTM), Patrik ANDERSSON (S – Yamaha), Werner MÜLLER (AUT – KTM) and Euan MCCONNELL (SCO – TM). Who all make a return to World level racing. However, the big favourite here will be none other than the triple Enduro World Champion, David KNIGHT (GB – Suzuki)! The giant from the Isle of Man will have the pressure of living up to his previous form, and will have to fight off many riders who dream of climbing on an international podium. 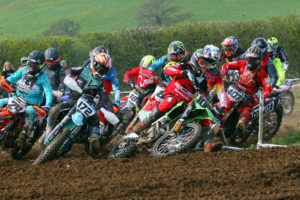 Sixty-six riders will take part in this very first round of the Champion Lubricants Enduro Open World Cup. This gives an indication of the early success of these new World Cups created by ABC Communication and the FIM… These three categories should also bring the fans in Dahlen even more to cheer about on the four spectacular tests created by the MSC Dahlen eV im ADAC.